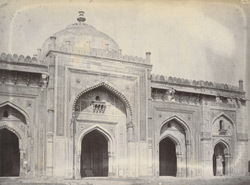 Photograph of the Qila-i-Khuna Masjid at Delhi from the Archaeological Survey of India Collections, taken in the 1880s and attributed to Henry Hardy Cole (the attribution to Cole is probably incorrect). This is a close-up view of the mosque, showing completed restoration work on the facade where the plaster over the masonry has been repaired. The fort was begun in 1533 by the second Mughal emperor Humayan (r.1530-40, 1555-56), who named it Din-Panah (Refuge of Religion). He was deposed by the Suri sultans in 1540 and exiled until 1555. During this period the fort was possessed by Sher Shah (r.1540-1545), who renamed it Shergarh. The mosque was constructed by Sher Shah in 1541 as the finest monument of his reign. One of only two surviving buildings within the fort, it is situated close to the western entrance gate of the fort. Each of the five entrance arches on the façade is framed within a higher arch and it is richly carved in black and white marble and red sandstone. This superly proportioned structure built in Afghan style was important in the development of Indian-Islamic architecture.